My husband Bernard and I spent this weekend celebrating the marriage of two of our good friends. Weddings are my favorite; there is always so much hope, love, and happiness in the air. Watching two people who love each other, profess their commitment to one another, well it gets me every time. While I love the wedding part, hearing the couple’s story and how they came to cross one another’s paths has always intrigued me. Many love stories originate in an entirely serendipitous way. Bernard and I at our friend’s wedding in Wrightsville Beach, NC. Our friends who just got married, for example, their story starts in Alaska thousands of miles from where each of them lived. Both of them for personal reasons felt compelled to travel to Alaska for a summer, and the rest is history. It just goes to show you that you never know when you could cross paths with your future spouse. – Don’t count anyone out. I know many couples who were friends beforehand, or co-workers and one-day something changed, and they saw one another in an entirely different light. Perhaps you’ve already met the person you will marry. – Let love find you. Anything achieved by force doesn’t usually end well. Be patient and let fate happen. – Be open-minded. A common theme I hear in a lot of love stories is that at first one person or both didn’t like the other. Don’t rush to judgment, take the time to get to know the person – you may have more in common than you think. 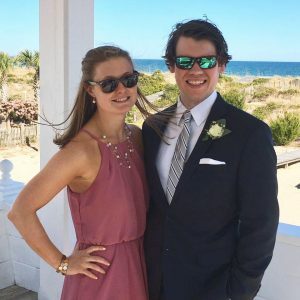 This entry was posted in Girlfriends and tagged dating, love, weddings, Wrightsville Beach.